Two buyers from China unleashed a bidding war over a pigeon. The bird was on auction the other day in Belgium, where its price went up from EUR 532.000 to EUR 1.25 million in just the one hour that the bidding war lasted. The eventual buyer from China isn’t named in this BBC piece on the sale. The pigeon’s name is Armando, although the local Belgian pigeon aficionados dubbed the bird the ‘Lewis Hamilton of pigeons’. Just like the Formula 1 driver, Armando has racked up his fair share of wins in pigeon races. He’s now quit racing and will spend his well paid for retirement breeding speedy offspring. Pigeon racing has been big in China for quite some years now. Back in 2012, I visited Hu Zhen Yu in the southeastern coastal city of Wenzhou. I talked with him about Dolce Vita, a pigeon he had then just bought from the Netherlands for EUR 250.400 - a record amount in itself at the time. Hu, then 43 years old, made his millions running a shipyard. I called him out of the blue from a train the morning after he had made his record purchase. As I was headed to Wenzhou anyways, would he have some time to talk about pigeons later in the day? Hu, though still running the shipyard as his day job, didn’t hesitate: I was welcome to drop by his CEO office on the top floor of a Wenzhou hotel whenever I would get there that day. A CEO of a fairly sizable company dropping everything to talk about his hobby… he didn’t get rich by leaving opportunities on the table for too long. His office had more pigeon paraphernalia than ship stuff. He proudly showed me the latest edition of the magazine Race Pigeon News China, which featured pigeon NL2008-2029821 as the month’s cover girl: Hu’s Dolce Vita. He then showed took me to the rooftop of the hotel. There, he kept six hundred racing and breeding pigeons. He employed ten people to care for them full time. 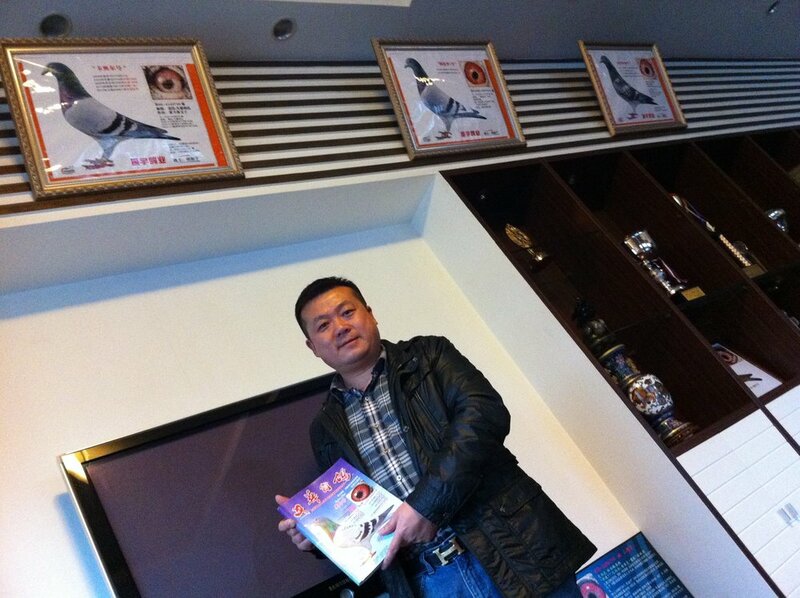 As pigeon racing had already gained huge traction then, Hu restricted himself to only participate in China’s ten biggest races, where the winner takes home a million RMB (1.3 million EUR). In 2012 there were already an estimated 300.000 Chinese traders driving up prizes in the international (although mostly European) trade in race pigeons. Hu told me he considers a pigeon to be a better investment than a fancy bottle of wine or an expensive car, although he also owned plenty of those. “There’s a good chance that the offspring of a prized pigeon will earn you a lot by winning races,” Hu said. I’ve always considered pigeons flying rats, mostly encountering them scuffling around in smelly city alleys, often missing a limb. Never before considered them potentially earning millions. A testament to my business sense, I guess.